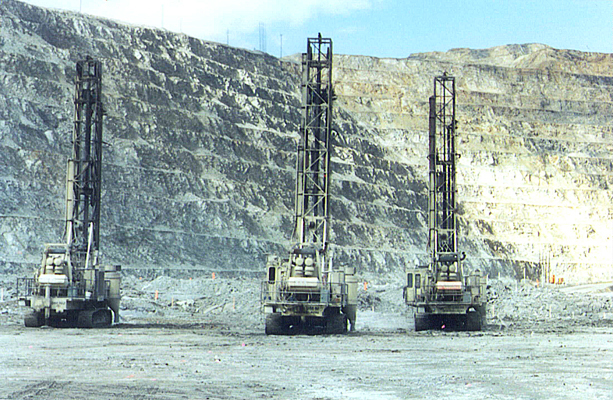 Three old tandem Robbins drills in operation. 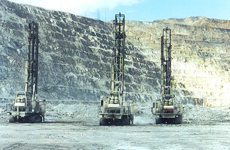 Lack of dust is made possible by the Filter/Clone® cyclonic dust collector mounted on each drill. Blowers on Filter/Clone® dust collectors are not purchased from standard product lines of fan manufacturers — they have been custom designed to meet the specific requirements of the dust collector. Precision manufacturing and dynamic balancing of the fabricated aluminum fan wheel produce a highly efficient, lightweight blower system which greatly reduces thrust loading on hydraulic motor bearings. 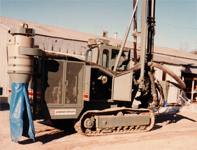 Size 3SB Filter/Clone® dust collector mounted on Ingersoll–Rand T4 drill. This shows the flexibility of the suction hose allows the hose to remain attached when the tower is lowered. 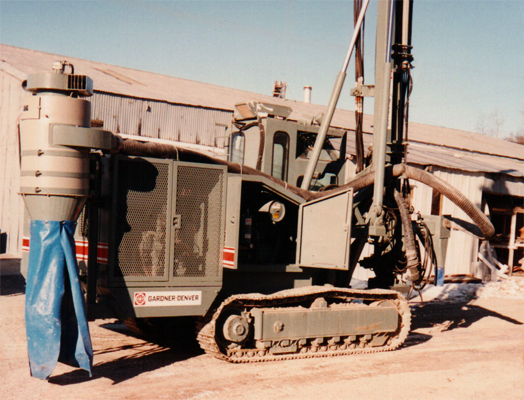 Size 2R4 Filter/Clone® dust collector mounted to the rear of Gardner–Denver SCH–4500 crawler drill. The suction hose can be as much as 35' long without causing major drops in suction capacity. 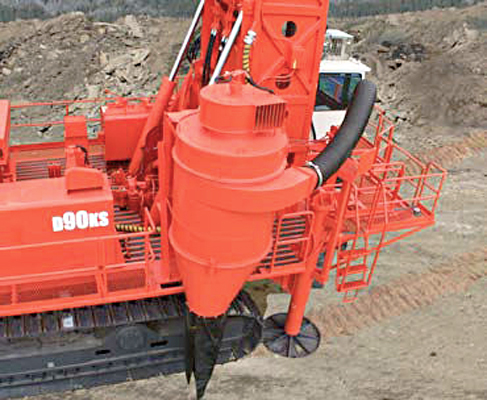 Close up of Size 7SB Filter/Clone® dust collector mounted on D90KS rotary drill manufactured by Sandvik Mining and Construction. Highly reliable, state–of–the–art electronic timers are available in either 12 or 24 Volt DC or 110 Volt AC models to match the drill system capability. The timer is conveniently located in a watertight compartment formed integrally with the dust collector housing and is easily programmable to regulate impulse air in accordance with drilling conditions. Rugged, heavy duty design, in–house control of all fabricated parts, and use of high–quality components (valves, motors, etc.) from major manufacturers produce a rugged, reliable system. 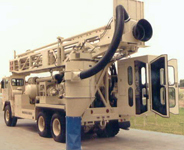 Filter/Clone® Systems are the most efficient and dependable dust control option available. We have over 34 years experience in manufacturing dust collectors for blasthole drills and maintain a full factory inventory of spare parts. 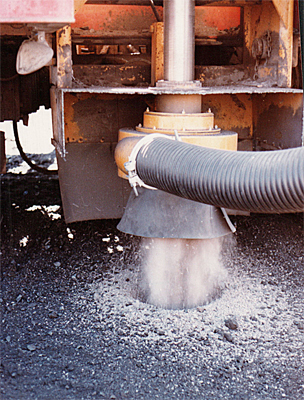 Filter/Clone® dust collector Total Collection pickup pot in operation on Ingersoll–Rand rotary drill. Total collection can usually be achieved when drilling a hole of about 9" or smaller diameter. Very large size hole drilling may require partial chip collection or dust only. Heavy duty pleated filter elements provide a large area of filter media within a small space, thereby offering higher air flow and lower filter loading. The filter media is a synthetic fiber specially designed to resist wet and humid conditions. Review the list of just some of the 70 different models of Drills using	Filter/Clone® dust collectors. The Operation, Maintenance, Troubleshooting and Download information is just one way Joe Tipton, Inc. makes to support drill operators. 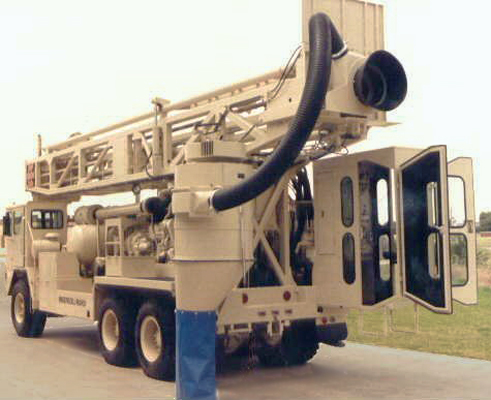 Contact Joe Tipton, Inc. or a Dealer to determine which Filter/Clone® System works for your equipment and drilling conditions.